Jose Hidalgo wrote: @balala : I understand... but the [Variables] section already has a PrevIcon=32 line ! OK, the rainy icon has finally disappeared. The temperature problem(s) still remain(s). balala wrote: fixes ONLY the issue of the always raining icon. Jose Hidalgo wrote: @xenium : I have taken a look, but that skin has the same problem I'm trying to solve with this one : after midnight we can't see [Today] anymore : we can only see [Now] and [Tomorrow], but not the weather in the morning. I can't believe that nobody has noticed this before, it's a deal-breaker for me, lol. There is the possibility of adding and Today , but I did not include it in the skin. For Today, the weather forecasts are displayed for the whole day, as well as for Tomorrow and the next few days. I think for what you want, the best would be the hourly forecast. So you can see, what is the weather forecast for the morning. @xenium : your skin clearly shows your skills, congratulations. As for me, I want something simpler and more discrete, so I won't use it. All I need is to be able to make it work, with the precious help of @balala. If you want to help us with this precise skin design, you're welcome. Jose Hidalgo wrote: The temperature problem(s) still remain(s). I continuously tested the skin yesterday and today (just over daytime though), but it works properly. I suppose (if I didn't somehow misunderstand you) the problem occurs over night. Am I right? Jose Hidalgo wrote: If you want to help us with this precise skin design, you're welcome. Of course, with great pleasure, if I can ! Jose Hidalgo wrote: That's unfortunate when you go to sleep after midnight and you want to know next morning's weather ! Jose Hidalgo wrote: we can only see [Now] and [Tomorrow], but not the weather in the morning. I can't believe that nobody has noticed this before, it's a deal-breaker for me, lol. If I understand well, your wish is to see at midnight the forecast for the next morning, right? You guys are awesome ! Maybe together we can sort this out. Apologies for not replying soon enough, I'm quite busy these days, although my problem remains of course. More testing to follow as soon as I can. If it looks like this, would it help you? Wow, that would be incredible ! I'm looking forward to testing it if you share your code, and reporting back. Thank you ! To perfect it even more, instead of having right/left arrows, maybe just clicking on the entire skin could alternate between the two possible displays. That would be perfect for me. Jose Hidalgo wrote: Wow, that would be incredible ! I'm looking forward to testing it if you share your code, and reporting back. Thank you ! The skin code is written by me and I kept the design of your skin. Place your cursor over each icon for details. The skin is updated to 10 minutes. Test it and see how it works, if it's what you wanted. @xenium : I've just installed it. So far it looks great ! THANK YOU ! I will test it over the next week and report on the results. I'm going away for the WE so I will start testing next tuesday. Stay tuned, but really, thanks for that pleasant surprise. @balala : first of all, THANK YOU for your awesome help all along this topic. Without you I wouldn't have gotten this far, and maybe I would even have stopped using Rainmeter. So big kudos to you my friend. We almost managed to make it work and get rid of the last bugs. Here's a screen cap of tonight (3 AM), with your version on the left and xenium's version on the right. As you can see, something seems to be wrong with the middle column (icon and temperature). But if xenium's version works as expected, I guess I won't bother you anymore with my questions (at least not within this topic ). You are an awesome person, kind and helpful as may be, and it needs to be said and acknowledged ! 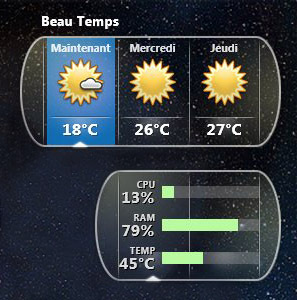 @xenium : one tiny observation about this screen cap : your version seems to indicate 1°C more than balala's version (e.g. 13°C vs. 14°C). So which one is the most accurate ?